Finding and maintaining your dog’s ideal weight can significantly extend your pet’s life. Dogs fed to ideal body condition lived 1.8 years longer than their overweight litter mates. That’s a bonus of nearly 2 extra years of life — just for keeping your dog close to his ideal body weight. So, where do you go to find your dog’s ideal weight? To get an idea of what your dog should weigh, you could simply look it up in a table of ideal pet weights. However, nearly every table provides this important information in a range of weights — and not a specific number. For example, the Association for Pet Obesity Prevention suggests a weight range for Labrador Retrievers of 65 to 80 pounds. That’s a significant difference of nearly 23%. And that figure can vary even more — depending on whether your pet is a male or a female. And what about mixed breeds? Where do you go to look up their ideal weights? Unfortunately, there’s no clear reference for every individual dog. Because dogs come in so many builds, shapes and sizes. Here’s a solution that works for all dogs. The very best way to determine your dog’s ideal weight is to use the same method used by vets. 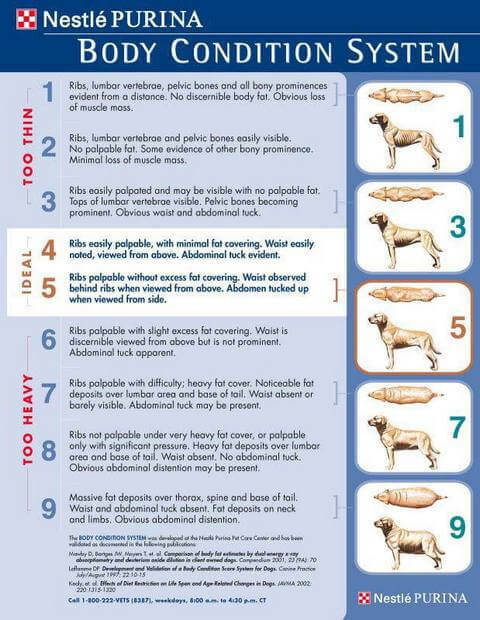 The Purina Body Condition System1. The following 1-minute video2 demonstrating how you can ensure your dog remains in ideal body condition. Your rating will be based upon comparing your dog’s appearance to this standardized diagram — and then palpating (feeling) his ribs and frame. Determining an ideal weight goal can make a real difference in how long your dog lives. So be sure to estimate the right serving size for your dog. And be ready to change that amount whenever you switch to a different food. Sure, it’s a little extra work. However, if you love your dog as much as we love Bailey and Molly, maintaining your pet’s ideal weight can be a very rewarding goal.